How to tension the Ultimaker short belts once for all? 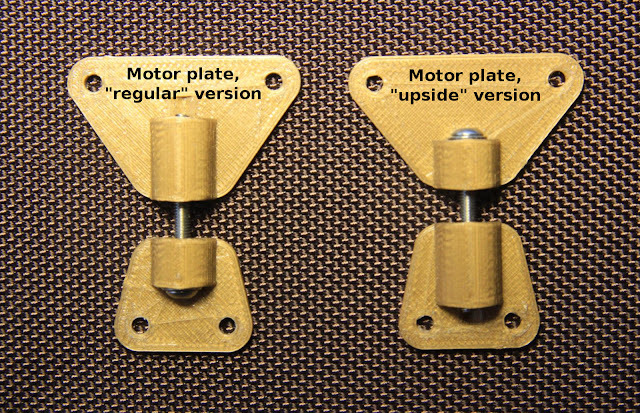 The short belts that drive the main rods from the X and Y steppers must always be kept tight. Otherwise the print quality really gets bad. Two symptom that are easy to spot is non-round cylinders or "bouncing" waves in the surface of the print. I just could not stand this anymore, so I designed this thing and this derivative (with an additional spring). Unlike the main belts, the short belts seem always to get sloppier with time! So I regularly had to check and re-tighten the steppers. 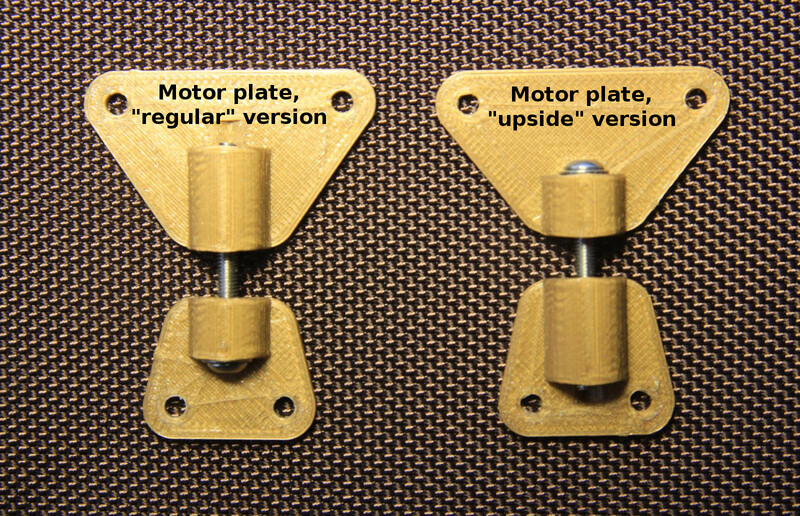 Finally, in my opinion, no one can achieve a precise belt tension by pushing a stepper with one hand, while screwing with the other one! Fine, robust and stable belt tension adjuster (at last) ! So I finally addressed the issue by designing my own tensioner, and stop using a procedure that damages my printer while not really fixing the issue in the first place. Printed with 0.15mm layer height, 100% infill. With or without PTFE thermal insulators. Having a long screw to slide the steppers down gives both force and precision. And no more damage to the case. I also made them thin so they do not get in the way when I move the printer around, since they are on the outside of the case. Finally, nylock nuts are cool but they tend to rotate freely in PLA if their slot was not exactly adjusted to their side. This is tricky because it depends much on temperature and printer settings, especially with thin walls. Finally, the stepper sometimes become hot enough to meld PLA. 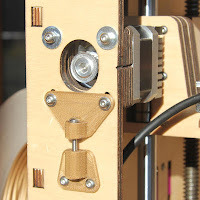 I do not fear much that the heat could propagate via the mounting screw and through the plywood layers, but I designed a special version that uses two 3mm pieces of bowden tubes as thermal insulators on the two stepper screws (see above). I used bigger washers for these to dissipate heat further. As a word of caution: do never over-tighten a belt or you will ruin the bearings! The setup I described so far lets you go much farther than what is required. After some discussion about it in the forum, I made a derivative which adds a spring between the screw head and its washer. 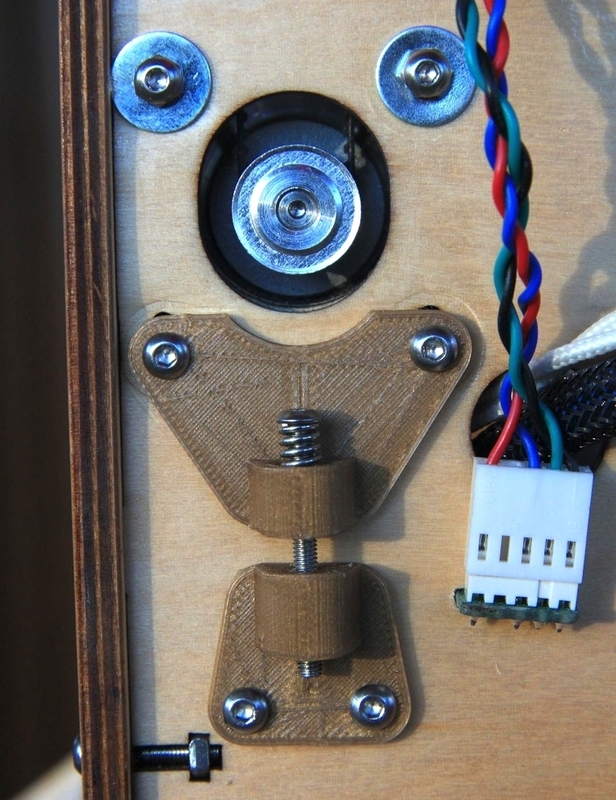 Keeping the stepper loose enough to slide along the wall may not be a good idea because the stepper may start resonate when direction changes (and you'll get wavy vertical textures around the corners). 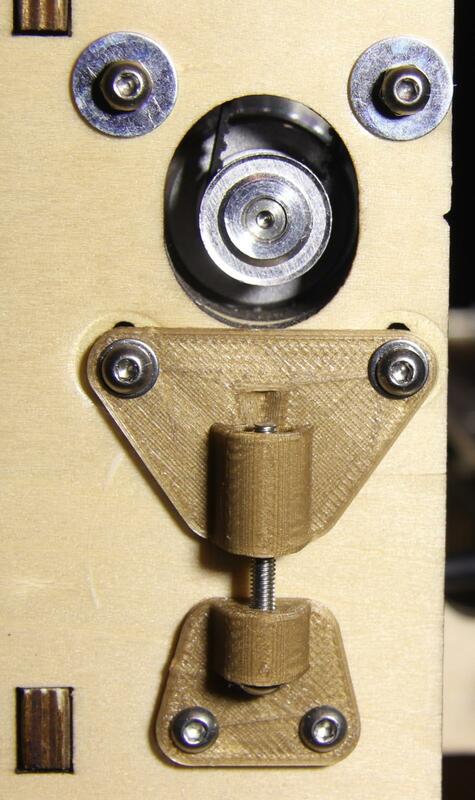 Spring-loaded tensioner with a loose stepper. Anyhow, the spring better takes care of the tension and probably dampens excessive settings. Time will tell if the revision really is worthwhile. never had to change it since. your plates are a little less invasive perhaps but do require more parts. I share the idea but sincerely, I do not think that any backlash is left out with tmy tensioners (especially on so short belts)... There is not much to be gained here, and there are other and much bigger sources of mechanical errors (most prominently due to the longer belts, bed shaking and so). A direct drive setup may enhance the print but it would surely not be in the top of my list once you fixed the short belt correctly. But to me, the cons are unrelated actually: the stepper motors protrude so much out of the ultimaker frame when direct-driven that I really would fear moving it around (and it takes much more room to pack). May not be a problem for some though.